Trojan Remover runs on Windows 10 (all versions), Windows 8/8.1, Windows 7, Windows Vista and Windows XP. The FastScan component of Trojan Remover is set to automatically scan for Malware every time you start your PC (you can disable this if you wish). 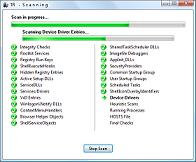 You can also run the FastScan manually any time you wish (START | All Programs | Trojan Remover | FastScan), and schedule it to run at a set time daily (useful for those who do not turn their systems off at night). The FastScan checks all program-loading points - it is a quick and effective check for actively loading malware. The program comes with a comprehensive help file (this can be viewed online, here). Context-sensitive help is also available for most screens by tapping the F1 key. This essential security utility is available for you to try out FREE. Download a fully-working evaluation copy today. The program will work for 30 days before you need to decide whether you would like to register it. The registration fee for Trojan Remover is US$24.95*. This fee covers all database updates and future program updates for 1 year from the date of registration. The fee for renewals in subsequent years is currently set at US$17.95* per year. You can install Trojan Remover on up to 3 additional computers, for no extra charge. You can register it online now, via secure server. * EU residents will also have to pay VAT at the standard rate applicable in their country. © Copyright 2001-2018 Simply Super Software. All rights reserved .